There is something magical about the stories in Taz Thornton’s Whispers from The Earth. Gifted directly from the ancestral spirits to the author, these parables are both a highly enjoyable read and an inspiration; each tale firing the imagination and containing a truth within. Teaching stories have been used throughout time and it’s wonderful to have new tales to explore by such a gifted storyteller. Containing a dozen stories, including: Why Pheasant’s Face is Red; The Girl Who Was Different and the Wasp King; Faerietale of the British Isles and Grumblethwick’s Bad Day, these are stories for you to dip into for yourself as well as for sharing with others. 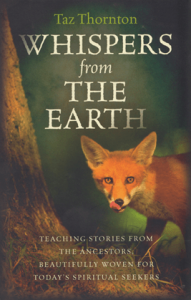 Whispers from The Earth also contains a chapter with very useful guidance on how you can channel stories for yourself, followed by four excellent stories from some of Thornton’s students, demonstrating the diversity of style and storytelling. Guaranteed to inspire you to connect to and share your own stories Whispers from The Earth is highly recommended, with something for everyone. Perfect for curling up comfily on a sofa alone, for storytelling around the fire and for use as a personal or workshop inspiration on the art of storytelling.